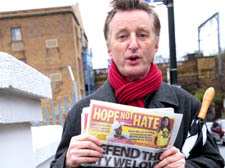 MUSICIAN Billy Bragg was in Camden Town on Saturday to urge voters to go to the polls in the mayoral elections. He gave a free concert to leafleters in the Trinity United Reform Church in Buck Street. Mr Bragg is signed up to the Hope Not Hate campaign which aims to stop the British National Party getting a foothold in the London Assembly. Bragg has been an anti-racism campaigner since Rock Against Racism in the 1970s. He finished his set with the Woodie Guthrie song All You Fascists Are Bound To Lose. The BNP are not putting froward any London Assembly candidates in Camden, but they are standing for Mayor of London. The system of proportional representation means Camden votes could still help them get the 5 per cent of the vote they need to win a seat. Mr Bragg is a Labour supporter but the campaign does not tell people which party to vote for. He added: “The policies which the BNP have aren’t based on rational ideas but are based on hatred. My real concern is that the British National Party are gaining legitimacy and will get a protest vote.